Each day we are given the opportunity to make a new start. As Easter approaches let us think about any new starts that we can make with our family, friends or with God, remembering that God is always ready to help us to start afresh. The most solemn week of the Christian year, Holy Week is the week leading up to Easter, and this is the time during which we particularly remember the death of Jesus. At St. Edward’s we will be reflecting on Holy Week by celebrating the Liturgies (please see below). Parents of the children in the year groups presenting the Liturgies are very welcome to attend. Monday 8th April at 9:00am - Y3 Palm Sunday Liturgy -Year 3 parents are invited. Holy Week begins on Palm Sunday. Thursday 11th April at 9:00am - Y4 Maundy Thursday Liturgy -Year 4 parents are invited. Maundy Thursday is the Thursday before Easter and it is remembered as the day of the Last Supper when Jesus washed the feet of his disciples. Friday 12th April at 9:00am - Y5 Good Friday Liturgy - Year 5 parents are invited. Good Friday is the Friday before Easter - it commemorates the Passion and Jesus’s crucifixtion. As I have mentioned in previous newsletters, it has been brought to my attention that pupils in KS2 are playing the game Fortnite. As with many online games, Fortnite comes with risks to children and young people. The game is PEGI rated at 12+, however, proof of age is not required and this can expose younger children to inappropriate content and comments from other users. The NSPCC website has relevant and useful information on how parents can help their children enjoy online gaming safely. Please note that this week (week ending 5th April) has been the last week of after school clubs for this term. Fit for Sport will continue to run as usual. School will finish at 1:30pm on Friday 12th April for the Easter holidays. Children return to school on Monday 29th April. Dear Lord Jesus, please help us to be more understanding and always ready to make a new start with you and with each other. Amen. Class 13 are our attendance cup winners this week with 98%! Well done! In Art Club the children designed their very own colourful puzzles and then had fun putting them together! In Year 4, as part of the Literacy curriculum children are reading the book ‘Odd and the Frost Giants’, which tell us the story of a young Viking boy . 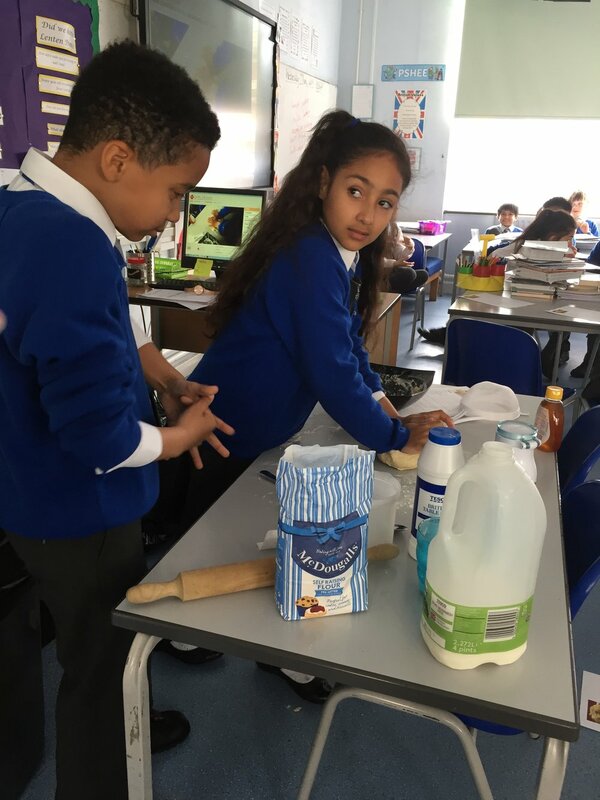 This week in class, children made damper - Viking's bread - and afterwards they wrote fantastic explanation texts on how to make yummy bread. This week, each year group have been completing their sponsored event for Mary’s Meals. Early Years hosted a sponsored obstacle course. They worked with their teachers to complete the course in the KS2 playground and all children completed it. They had so much fun! Years 1 and 2 completed a sponsored dance. This was just any dance; they had to dance for as long as they could without stopping! Year 3 completed a sporting event. They had lots of fun in the playground, keeping active whilst raising money. Year 4 completed a sponsored spellathon. They had to learn 100 words and all worked really hard. If you see them in the playground, ask them how their spelling has improved. Years 5 and 6 took part in a 3 km fun run! The children worked very hard to raise lots of money. They also worked hard to complete the run! They puffed and huffed their way around, but they all truly made a valiant effort. Thank you to all the parents who got involved and sponsored their child. We have raised lots of money and all donations will go to Mary’s Meals which is a truly worthy cause. Read next weeks newsletter to find out how much we have raised. The class who raises the most will win an extra prize from Mrs Wright! More are our house champions this week with a total of 898 points! Keep up the good work!